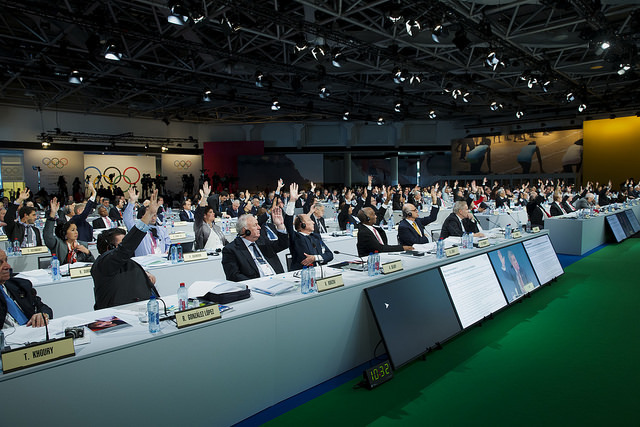 Reporting from the Grimaldi Forum in Monaco – On Monday the International Committee (IOC) at its 127th Session approved Agenda 2020 – a set of 40 sweeping reforms designed to move the Olympic movement into the future, to change the IOC before it is forced to change. All 40 recommendations were unanimously approved with no abstentions. 96 of the 104 members were present and voting; there were 3,840 ‘yes’ votes and not a single ‘no’ vote. It sounds outrageous. Almost eight hours of presentations, questions and comments – 83 interventions in total – and not a single person expressed any doubt at the final opportunity. On Tuesday IOC President Thomas Bach commended his membership for being responsible despite any difficulties caused based on varying interests and agendas. “In my wildest dreams I would have not expected this,” Bach told reporters Monday night. Clearly, it was about unity. It was about recognizing what was necessary and inevitable and then moving forward as one. “This started a year ago, so we’ve had a whole year, the IOC members, to question, debate, to argue – so we’ve seen these before and we’ve had the opportunity to engage in them and change them and modify them accordingly. This unity aligns with the picture that Bach said emerged when the Agenda 2020 puzzle was finally assembled. Maybe 3,840 hands can move the world.